I am usually wary of grocery store fish counters but I found the nicest, very fresh, fillets of Farm Raised Steelhead on sale at Albertson’s yesterday. As an avid fisherman I have learned to appreciate fresh fish and when or if I do purchase fresh fish it must first pass a few very important tests. First, the fish must never be frozen. I often see “previously frozen” fish at the fish counter, thawed and displayed on ice. If it was frozen why did they thaw it? How long ago was it thawed? I’m not saying I won’t purchase frozen fish. I just prefer to examine the packaging myself (for me it should be flash frozen or vacuum sealed) and I prefer to thaw it myself…thank you very much. My second test is visual. Does the fish look fresh? If it is a whole fish the eyes should look clear, not clouded. The skin should be firm and glistening and should not look dry or wrinkled and scales should not be loose or falling off. Fillets too should glisten with moisture and should never look dried out. All fresh fish, whole or filleted, should be kept on ice and unwrapped. If the fish is just lying on a rack or shelf, or if it is packaged and wrapped, I’ll usually keep looking. Next, how does it feel? If you press your finger on a fresh whole fish it should feel firm. The flesh should spring back quickly when you take your finger away. A fillet may not be as firm but if you press your finger into a fillet and remove it, the flesh should immediately spring back. If an indention remains when you take your finger away, or if the fish feels mushy, then the fish is probably not the freshest. Lastly and simply, how does it smell? You may feel a little funny asking but really, I’ve never even had a person behind a fish counter look surprised. I always ask to smell the fish which should smell fresh and clean, perhaps a little like the mist of a breaking wave…and never, ever should it smell fishy or strong. 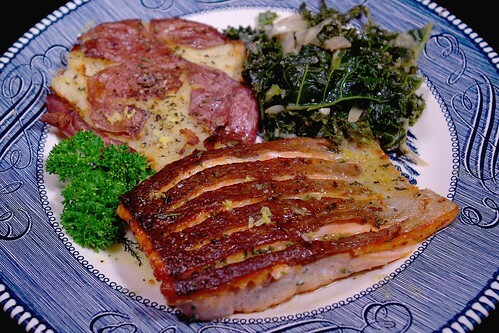 The Albertson’s Farm Raised Steelhead fillets passed every test with flying colors. Not only that, at $5.99 per pound it was a great deal! The 1-1/2 pound fillet was big enough for two dinners for 2 for Kathy and I which works out to about $2.25 a plate. Not bad for fresh fish! I still had half a bunch of kale from the other night and I wanted to use that up so this Saturday night dinner really was quite the value meal. Speaking of feeling funny…I feel a little funny posting other people’s recipes on my blog. If this is going to be “Recipes Randy Cooks” though, then it should most definitely include recipes created by others. Kat loves the crispy salmon skin the sushi chefs make so I was looking for a way to crisp the skin when I found this video by Gordon Ramsay. I was getting a little tired of rice so I chose an old favorite potato recipe, Crash Hot Potatoes. Like I told my friends on Facebook, if you have not tried this potato recipe…do it…do it now! You will not be disappointed. Heat 1 Tbsp. olive oil over medium heat and cook the shallots and garlic until just beginning to brown. Remove to a bowl and set aside. Add another Tbsp. olive oil to the pan and sauté the kale for two minutes before adding the lemon peels, rosemary, chicken stock, and salt & pepper. Bring to a boil, lower the heat, cover and simmer 10 minutes. Remove the cover, add the shallots & garlic back into the pan and continue simmering uncovered a few minutes more allowing most of the broth to evaporate. Remove the lemon peels and rosemary and serve with a drizzle of the lemon vinaigrette from the fish recipe. While pre-heating the oven to 450 degrees, boil the potatoes until they are just cooked through, about 10 minutes. Drizzle olive oil on a foil-lined sheet pan and place the potatoes on the pan. Using the bottom of a jar or drinking glass, gently but firmly press the potatoes until they burst, then flatten them to about ½ inch thick while trying not to break them apart. Drizzle each potato with olive oil, season with kosher salt & fresh ground pepper, and sprinkle with the rosemary. Bake until the potatoes are browned and crispy, about 25 minutes. Sprinkle with a little of the lemon zest and serve. Rinse and pat dry the fish so that it is very dry. Using a very sharp knife, make a series of deep slices into the skin, crossways along the center, about every three eighths of an inch. (The slices should not reach the edges of the fillet.) Season the skin side with kosher salt, lemon zest, and chopped rosemary making sure to get plenty of the seasonings down into the slices. Drizzle with olive oil and set aside until your sides have been cooked and are ready to serve. When you are ready to cook the fish, Heat 2 Tbsp. of the olive oil in a non-stick pan over medium high heat until the oil begins to smoke. Carefully place the fish into the pan, skin side down, and do not move it until the fish appears to be cooked about three quarters of the way through. While it is cooking add salt and fresh pepper to the exposed side. When the fish appears to be cooked about three quarters of the way through, gently turn it over. Cook 2-3 minutes, turn again, and cook one minute more on the skin side. Remove the fish from the pan and plate skin side up. Drizzle lightly with the lemon vinaigrette and serve. This entry was posted in Entree, Seafood and tagged bliss, Braised, crash, crisp, crispy, Fish, Garlic, hot, kale, lemon, potatoes, red, salmon, seared, shallots, skin, steelhead, trout, vinaigrette. Bookmark the permalink. And that salmon skin was so wonderfully crispy 😉 Yummy!